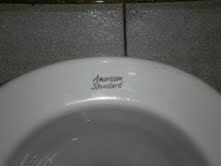 American Standard? Oh, I don't think so. 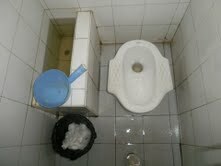 In my many years of paging through plumbing supply catalogs I never once saw anything that came close to this model -- one of several interesting toilets we encountered during our Thailand travels. Resembling a Japanese "croucher-upper", this type sits on an above grade plinth requiring a slightly awkward maneuver to properly position one's feet on either side of the basin. The flush mechanism is strictly do-it-yourself and a tub of water (here more of a trough) with a handled bucket are provided for this express purpose. Toilet paper? Available on a BYO basis only. Have you ever wondered how fruit in Southeast Asian countries gets its crinkle-cut profile? On my recent trip to Thailand I decided it was time to get to the bottom of this. I knew there had to be a special technique behind these eye-pleasing chunks of papaya, melon and apple. But it was the mini-crinkle cut carrots in the stir fried vegetables we ate our first day that really spurred me on. They were so adorable! Though I launched my quest early on in our trip, it was not until our last day that I got my answer. Our Habitat house complete (sort of) and our energy depleted, Abby and I decided to take a cooking class. 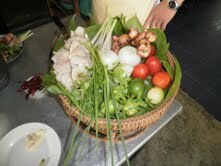 In Chiang Mai there are tons of cooking schools geared towards tourists. 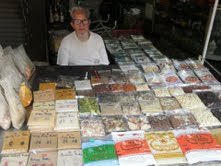 The class began with a trip to the local market a short distance from the school. Here our instructor escorted us to various stalls and explained the main food groups in Thai cuisine: tofu & noodles (egg and rice, thin, thick and thicker), root vegetables (including fresh turmeric and Thai ginger which is different from regular ginger), beans of multiple shapes and sizes, eggplants (she must have shown us 5 different types), peppers (the smaller the spicier) and, of course, the wide range of rice types sold by the liter. 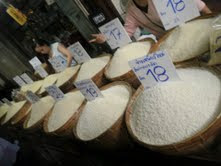 Apparently jasmine is considered the Cadillac of rice in Thailand. We skipped the meats and fruits which were self-explanatory more or less. While the discussion of raw materials was fascinating and elucidating, our ten minutes of free time enabled me to score and score big! Instead of roaming the aisles, Abby and I headed over to a kitchen wares dealer, a wizened gentleman with a threadbare beard and big glasses. With our instructor there to translate, we easily got our hands on the coveted waving knives. We settled on a Kiwi brand (one of the best manufacturers, according to our teacher)blade in two sizes (Beth -- I bought one for you too), and another related implement to score the outer surface. I can not wait to put them to use. Carrying small baskets filled with fresh ingredients, we headed off to school. Located in and around a 100 year old, traditional-style wood house, the school had several different, indoor-outdoor cooking areas, most covered by a roof only. We started by making red curry paste from scratch with a mortar and pestle. Then we graduated to a partially enclosed kitchen where cooked rice awaited us in a big aluminum steamer. With the addition of coconut milk, a little sugar and a lot of heat, we turned that staple into sumptuous sticky rice to be eaten with sliced mango. From there we went out back to a large area lined with individual cook-tops, each one outfitted with a wok. Here we made fresh spring rolls (wrapped in sheets of rice noodle), pad thai and curried vegetables (tiny egg plants, baby corn and carrots flavored with kaffir lime leaves and fragrant basil). The teachers adjusted all of the ingredients to suit our vegetarian diets. Turns out Thai mushroom sauce makes a very delicious substitute for oyster sauce. Hope I can find it at National Market. We finished the course by tucking into our freshly made food. The plentiful meal was exceptionally good, probably the best fare we had all week. Armed with our waving knives and a cook book from the school, Abby and I are eager to try our hand at Thai cooking at home. This afternoon we stopped by Napoli, our favorite gelateria in Hiroo, to pick up some treats to accompany our Sunday evening repast. While waiting outside with Pippi (no dogs allowed in the shop), I noticed a new flavor on offer. Spinach! Naturally I had to sample this delicacy so Eve took over leash duty while I went in. Would that I had had my camera with me but it is fresh out of batteries since we just got home from a Habitat for Humanity mission in northern Thailand (more on that to come soon). Some might take issue with the frozen confection's bright green hue. But in Japan, where matcha (green tea) flavoring is as common as strawberry, green is a perfectly acceptable pigment for sweets. And green IS my favorite color. The problem here concerns that other sense, taste. While living (and eating) in Japan I have gotten quite accustomed to foods that unite sweet with salty. The local cuisine really knows how to get this right. Better than most of the trendy variations on this theme that may be found in other parts of the world. Salty caramels? I rest my case. A little contrast is OK but spinach ice cream was a new one for me. I hope I did not grimace when the ice cream landed on my palette -- the flavor was a bit odd. I believe that "grassy" would be an apt descriptive. No make that "sweet and grassy." Not a winning combination. But I give Napoli accolades for their daring and verve. A few Sundays ago the weather was gorgeous. After an all-too-long string of cold, rainy days, the sun made a welcome appearance and the mercury rose into the high 60s at least. It was, in the words of my mother, a quintessential balmy day. It was also a great day to be a dog-owner. And like-minded folk with their furry, four-legged companions were out in record numbers. Or so it seemed. As we often do, Pippi and I set out to meet Eve on her way home from her teaching gig at the JCC. On the way there I ordered a take-away pizza with a plan of picking it up on the rebound. Wasn't that clever of me? Of equal brilliance was Eve's suggestion that we dine al fresco on our terrace. But this post isn't really about pizza ingestion. As we began our ascent up to TV Asahi Street, we came upon a spiffy, bespectacled guy toting the accessory du jour: a chihuahua. But instead of leading his little dog on a leash, the pampered pooch was sequestered in, but poking his head out from, an over-the-shoulder carrier. Kind of like a Baby Bjorn for dogs. Maybe it was a Baby Bjorn! Now that would be taking things just a step too far. I was eager to capture the moment but didn't have the nerve to simply point and shoot. Eve deftly took the challenge in hand and simply asked if we could take his picture. Unsurprisingly he agreed as you can see. I love the scale change between dog and owner. But I imagine the pup would have been happier strutting his or her stuff. When we got to the top of the hill, we turned left and crossed the street. TV Asahi Street has a bona fide sidewalk which is a bit of a relief. In the distance we spotted a short couple and a large furry critter. Was it canine? Ursine? Sasquatch? We weren't really sure. But then the man picked it up and began walking down the street. Turned out to be a very large, very hairy poodle. I quickly captured this surprising trio on film. Judging from their expression, I wasn't sure how the humans felt about having their photo snapped but we did not ask. I hope we weren't witnessing a dog-napping. On Saturday night after visiting some architect friends in Denenchofu, Eve and I had a strange encounter on the subway ride home. Even if I had been quick enough to capture the moment on film, I am not sure that would have been a good idea since it might have called unwanted attention to us. But no matter since the scene I am about to describe is seared on our memories. Shortly after we switched to the Hibiya Line in Nakameguro, a rowdy foursome boarded the train. Guys with short, short hair and loud, loud voices. No doubt US jar heads but, judging from the behavior that followed, not necessarily America's finest. Upon entering the car, one immediately stood between the seats, grabbed the hanging straps on either side and started doing pull ups while boisterously challenging his companions to top his score. I do not care to recount the string of accompanying expletives but I am sure you can use your imagination. At the risk of sounding schoolmarmish, this performance broke just about every Japanese etiquette rule in the book. And because of that gross transgression it was hard to interpret their actions as all in jest. But wait. The story gets worse. Rising to the bait, his buddy then assumed the pose and began hoisting himself up. When his jacket got in the way, he yanked it off. Still constricted, he ripped off his shirt too! Obviously he spends a lot of time pumping iron and was eager to show off his physique. But the dude was half naked! In the middle of a crowded subway car! And his raucous banter was even more sharply punctuated with profanities. We didn't really want to look but couldn't keep our eyes off of the spectacle. What could possibly happen next? Like us, many of our fellow passengers couldn't quite believe what they were seeing. Perhaps they were enjoying the entertainment. Maybe they were simply appalled by these ugly Americans or maybe some wished they had the balls to behave like that in public. One young woman sat there laughing like a hyena. A few glanced over at us to check our reactions since we were the only other foreigners in sight. As the train pulled into Roppongi Station, the boys put themselves back together and disembarked along with throngs of other passengers, including us. Fortunately we went to the left and they went to the right. And we wonder why they want us out of Okinawa. What is it about site visits and yarn stores? Clearly they have an affinity for one another. I thought Viale was a real find. But Sheep Meadow is paradise on earth. Located on Kichijoji's tony Taisho Street, this wool emporium is laden with much, much more than three bags full. The other day I went out to Kichijoji to see a 14-unit housing project recently completed by a well-known architect. It was a special preview for invited guests hosted by the architect before turning the project over to his client who will occupy one apartment and let the others. In anticipation of the area's commercial growth, the units were created expressly for renovation. Thanks to movable panels and other parts that pop out, they can be easily reborn as galleries or small shops when the inevitable spread occurs. What a breath of fresh air! Here in Japan shockingly few buildings are made to last and clients, especially residential ones, would much rather scrap and build than save and restore. Blurring the boundary between art and architecture, this project has a lot of charm and I wish it well. I would post a picture but then I might end up scooping myself. After touring the site, I did an about face and set off back towards the train station. As I was curious about Kichijoji, I meandered a bit. An energetic and appealing area, it has the flavor of a mini-Shibuya minus the riff-raff. I ducked my head into a few shops and poked around but did not part with money. That is, until I encountered Sheep Meadow. A few trans-Pacific crossings ago, I cut out an airline magazine article concerning a specialty yarn store in, you guessed it, Kichijoji. I figured that locating this tiny shop among the neighborhood's web of narrow streets would take some sleuthing. But when yarn is involved, I can be quite intrepid. 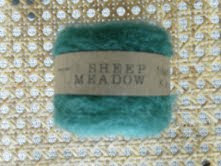 On a lark, I went into a clothing boutique and asked the shopkeeper if she knew where I might find Sheep Meadow. Her response knocked the hand-knitted socks right off my feet! There it was ... directly across the street. I know. This sent chills up my spine too. It was obvious that Sheep Meadow and I were intended to meet. Thank you yarn gods. Naturally, this serendipitous sequence of events made my find all the sweeter. This adorable shop fronts the street with plate glass windows decorated with a collection of little sheep. The entrance opens onto a petite sales floor with a circular table in the middle ringed with stools straight out of a milking barn. One entire wall holds cubbies filled with a spectrum of house-spun and dyed yarns. Rich reds and oranges, tender pinks and pale yellows, Delft blues and, my personal favorite ... the greens. Forest, lime, hunter and olive -- they are all there. This display was a feast for the eye and a pleasure to touch. While perusing the offerings, I struck up a conversation with the owner. Apparently she recently switched over to her spring collection -- lots of cotton blends, a smattering of light wools and a few luscious silks -- all only a ply or two thick. Her concept is to pair and knit strands of two complimentary yarns together. Since the yarns knit up beautifully, I might give it a go if I can find a suitable pattern that calls for super skinny needles. The lacy product might be nice for a summer sweater or some such. 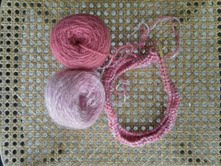 Of course I could not come away empty handed so I selected a little mohair and a skein apiece of a light wool and a satiny silk, both pink, that I might turn into a simple hat with a rolled brim. As I anted up, I mentioned that I had recently visited Viale. It turns out that the owner of Viale trained the owner of Sheep Meadow in the craft of spinning and dying. I always like small world stories with happy endings. And, judging from the broad smile on her face, Sheep Meadow's owner does too. The other day, my friend and I unearthed this fellow at a giant antique fair here in Tokyo. Dig that jaunty hat, three piece suit and leather satchel! Why he practically IS an antique! He towers over the rest of the crowd and his get up seems to demand attention. Doesn't he look like a character out of a movie? Can you imagine what his closet must look like? After observing him for a few moments, we both tried to surreptitiously snap his portrait. Consumed by a well displayed collection of tiny, blue and white plates, he did not seem to notice. After that he slipped away and we went to lunch. With spring struggling to make an entrance, I hardly feel like hearkening back to winter. But the event I am about to document may go unnoticed if I do not do so. A few weeks ago, during A & E's midterm school break, we headed up to Hokkaido for some skiing (remember I live with mountain people) as we have done for several years running. As usual, we chose Nisseko where the mountain may not be that challenging but the snow is unparalleled according to the resident experts. Something about winds blowing in from Siberia coupled with the ocean clime. One day, while said experts were off searching for steeper slopes and uncharted territory (fortunately they did not tell me about their off trail adventures until the end of the day), I parked myself with James from Portsmouth UK in the hope that this would be my big, break-through year. If you looked beyond his stringy, shoulder-length locks and general surfer-dude demeanor, James, who habitually said things like "Let's have a positive attitude, shall we? ", did have a certain English charm. 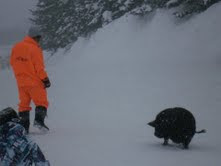 But, truth be told, the highpoint of my lesson was when we descended the mountain and found a pig (I kid you not!) strolling down the bunny hill. The portly little lady with her stubby legs and black bristles was quite a sight against the backdrop of pure white snow. Skiers of all skill levels stopped dead in their tracks to whip out their cell phone cameras or simply watch the scene unfold. Subsequently, James informed me that the pig (more likely an until-recently-wild boar) is one of several resort pets. The following afternoon, the girls and I paid a visit to Miss Piggy and the other critters -- an antler crowned deer with soulful eyes, an adorable red fox, a very friendly goat and a whole family of yellow ducks. But due to Abby's great love of pigs and my affinity for wild boars (I am inushishidoshi according to the Chinese horoscope borrowed by Japan), the porker was the main attraction by far. Affectionately called "Ramu" by her keepers, she passes her days in a snow pen where visitors are free to crawl inside and get to know her better. As if fully aware of Abby's proclivity, Ramu took an immediate liking to her and nuzzled right up. After visiting Ramu on her home turf, we accompanied her on her daily constitutional. Bribing her with treats, Ramu's orange-clad caregiver escorted her down the slope, periodically breaking into a jog lest overindulgence ruin piggy's girlish figure. ... but you can't hide. Spotted at Sarabeth's on Amsterdam Ave. Three Tokyo lovelies on their college graduation trip -- New York, Boston & Montreal in a whirlwind ten days. Imagine their surprise when I struck up a conversation with them ... in Japanese! Complete with jewel-encrusted cameras, intricate manicures and all the other trappings of Japanese twenty-somethings, they looked as if they had been air-lifted directly from Omotesando. After tanking up on Sarabeth's world famous waffles and pancakes -- unquestionably the cafe's most photographed meals of the day -- they seemed ready to hit the snow-covered streets and take on the big, bad city despite the freakish storm.